Size; 400 x 8". 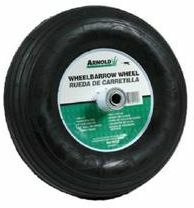 Hub Dia: 6". Wheel O.D. : 14". Wheel O.D. : 14". Bearing Dia. Types: 5 8" B.B.. Ply Load Rating: 2 445lbs. Tread Style: Ribbed.